Data suggest that the step from literary prize shortlist to winner might be an important inflection point in the operation of unconscious bias against women in the publishing ecosystem. 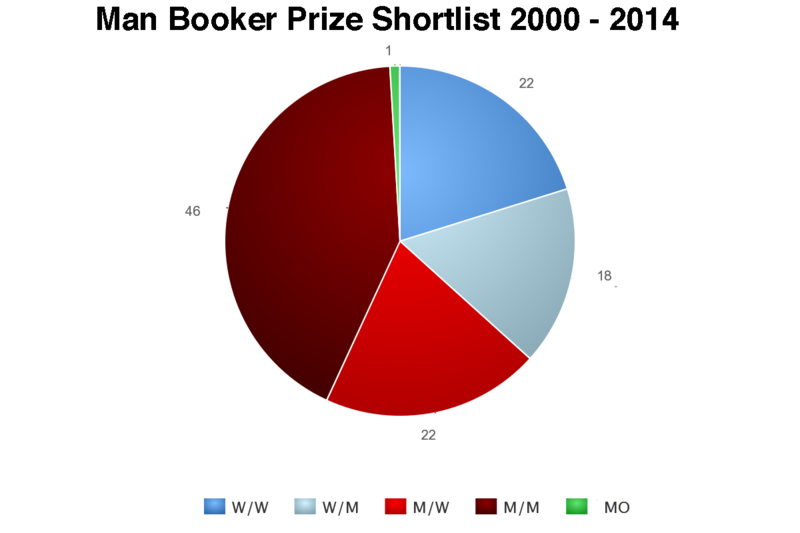 My recent focus on literary prize diversity has been aimed squarely at gender, both that of a book’s author and its main characters (those characters through whose perspective the narrative is funnelled; point-of-view characters).1 Due to the valiant efforts of the Literary Prize Data group, we now have data for the Man Booker Prize and the Edgar Allen Poe Award for Best Novel going back to 2000. Now look at what happens when the 90 shortlisted novels are whittled to 15 winners. 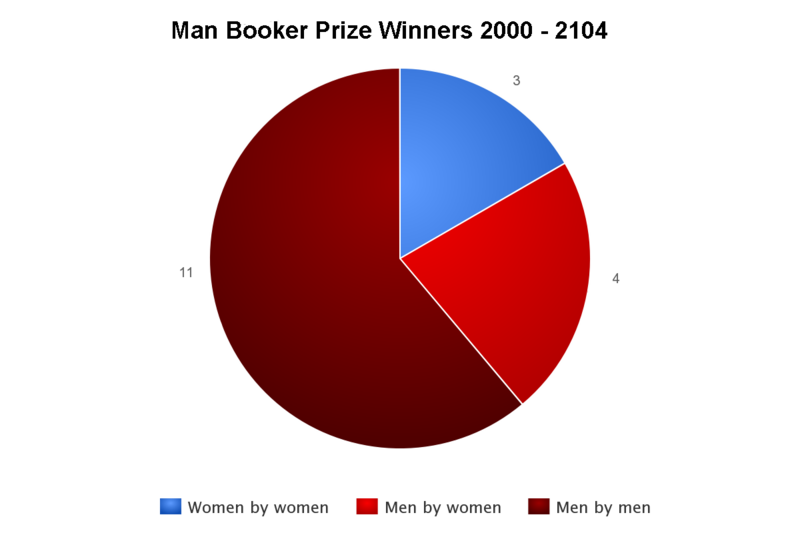 The overall proportion of women writers falls and those remaining write as often about men as about women. No men write about women. Of the 19 point-of-view characters, only 2 are women. In other words, the leap in prestige from Edgar shortlist to Edgar winner is mirrored by a drop in the number of female perspectives–women’s voices–from about 31.5% to 10.5%. 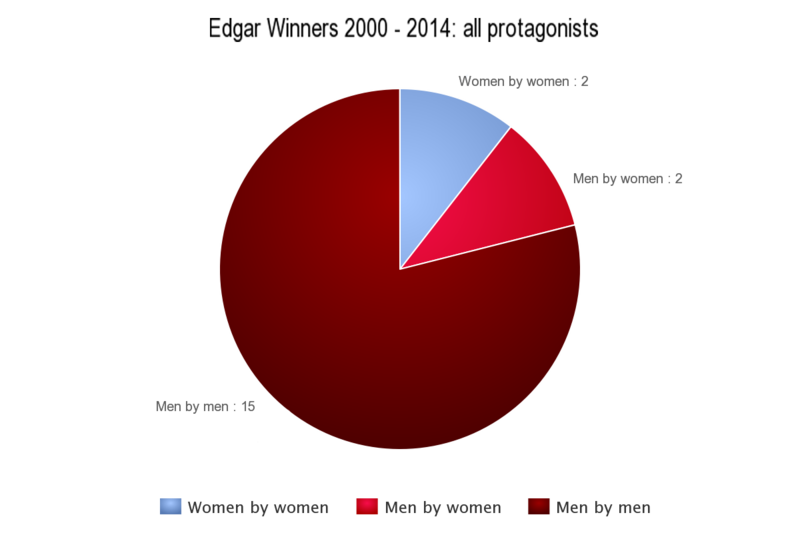 Note that the number of women writing about women, and men writing about women, are exactly equal, both 60 of the 322 total protagonists. Women’s points of view add up to 37% of the total. The change is relatively small. The proportion of women writing about women and those who are writing about men stay equal at 22 out of 109, or about 20%. 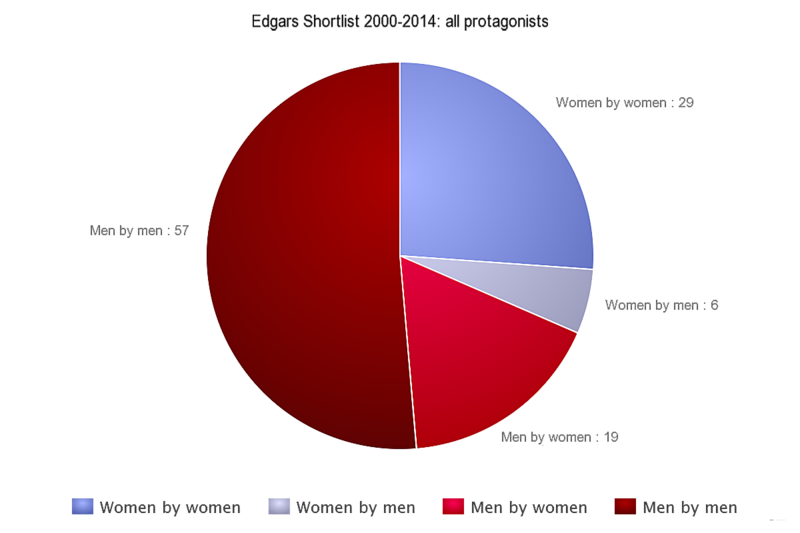 The proportion of men writing about women falls in comparison, to 18 of 109, or about 18.5%. In other words, the total percentage of female perspectives actually goes up a little, to 38.5. Women writing about men increases. No men write about women. And the number of women writing about women drops. In other words, the enormous leap in prestige, from being able to label your book Man Booker Shortlisted to Winner of the Man Booker Prize, is mirrored by a corresponding plummet in the proportion of in women’s perspectives from 38.5% to 16.66%. Looking at how and why might prove fruitful. 1 This can be subjective, which is why we’re building a searchable database. When it’s up, we will welcome input and corrections. 2 We’ve changed the way we count: instead of “About women,” “about men” and “about both” we’re now totting up the total number of POV characters. So if the book under discussion is a linked collection of stories written by a woman with, say, 4 stories written from the POV of women and 7 from those of men, we count 11 protagonists in all, and assign 4 to “Women by women” and 7 to “Men by women.” (These will probably be relabelled “Female by female” and “Male by male” for the simple reason that the notation F/M is less error-prone than, say, W/M. Also, “Female” and “Male” cover both adults and children.) In addition, you’ll see that the two sets of charts are marginally different. I’ll standardise it at some point soon. 3 The Edgar calls their shortlisted novels Nominees. 4 The yellow and green segments are, respectively, Non-binary and Other. The latter includes animals, aliens, and other non-human protagonists. Note that for the longlist we begin in 2001 when the longlists were first published. 5 The longlist is currently 13 books, the shortlist 6. This has not always been the case. 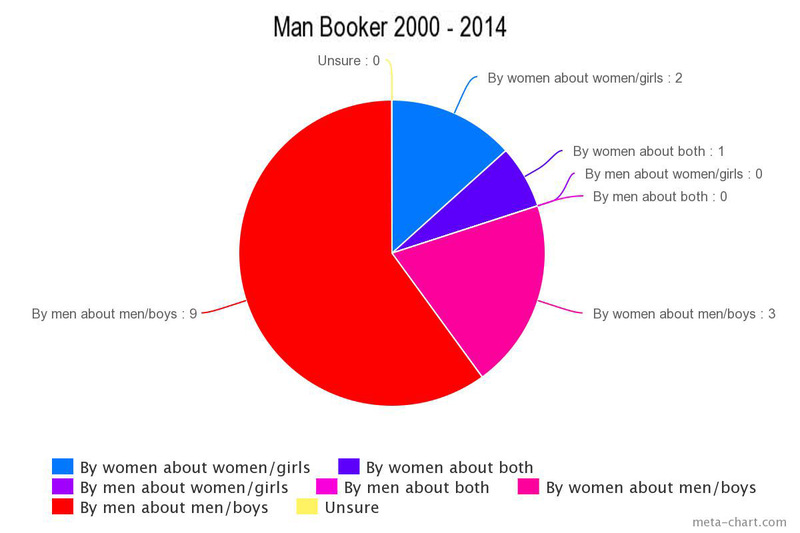 Am I somehow reading your graph for Booker winners 2000-2014 wrong? The graph shows only one female winner in those years, but anyone who follows the Bookers knows that that isn’t true. Margaret Atwood won in 2000 (The Blind Assassin), Kiren Desai in 2006 (The Inheritance of Loss), Anne Enright in 2007 (The Gathering), Hillary Mantel in 2009 (Wolf Hall) and 2012 (Bring up the Bodies), and Eleanor Catton in 2013 (The Luminaries). What I’m measuring is the books *about* women/from a woman’s POV. Lots of women win for writing about men. Women who write about women don’t win. See my original post. Looking back I see I misinterpreted M/W to mean “men writing about women”, instead of “men written by women”. My apologies. Still the graph is off, as it should read W/W=3, M/W=3 (Atwood, Desai, and Enright were all writing about women in their Booker winning novels). Wow, really interesting data. Thank you all for collating this! Casey, what I’m counting is women’s POV. The Inheritance of Loss is written from Sai’s POV, The Blind Assassin in written from Iris’ POV, The Gathering is written from Veronica’s POV. Unless you’re only counting first person accounts as POV, in which case ALL the novels written in the third person need to be discounted from the data. I really don’t mean to be argumentative, I understand and appreciate the point being made in your post, it’s just that the numbers are off. I’m scratching my head a bit. Clearly there’s been a slip-up somewhere. When I relied on my own data I originally got this chart. But the most recent chart is derived from numbers put together by others in the group. I’ll investigate. Many thanks for being persistent! It’s been a few years since I read The Inheritance of Loss; there are several POVs but it was Sai who really stuck with me, to the point where I feel the book really is Sai’s story. It’s perfectly fair to list it as being about both men and women, but that wasn’t represented on the chart. Also, I’d recommend you read it, for no other reason than that it is a beautiful novel. To take the premise of this post one step further, I’ll name two novels about women that really should have won the Booker. 2005: Kuzuo Ishiguro’s Never Let Me Go. Nothing against John Banville’s The Sea, it was a really great book, but Never Let Me Go was better. 2012: Deborah Levy’s Swimming Home. To be fair I didn’t read Mantel’s Bring Up the Bodies, I did read her Wolf Hall though, and while impressed by the prose I was left a little cold by the novel as a whole. The 2012 shortlist was one of the best in Booker history, an Swimming Home was the most profoundly affecting novel on the list. It’s hard to say that those two novels lost due specifically to a bias against women’s perspectives (in Ishiguro’s case he may have suffered just as much from a bias against Sci–Fi, while Mantel was the presumptive winner in 2012 from the moment the long list was announced and just kind of steamrolled the competition), but your post has made me realize that the two novels in the last decade and a half that I really think got robbed are both from a woman’s POV. And if we go back even farther (1986) it is an absolute crime that Atwood’s The Handmaid’s Tale didn’t win (again, nothing against Amis’ The Old Devils, but come on). I hear you! I’ve talked elsewhere (Facebook?) about what happens with groups making subjective decisions. This is where the bias really happens, I think.